Each year many businesses suffer from downtime, fire and in extreme cases, injury through neglect and a lack of electrical maintenance. By law a company or landlord needs to have their electrical equipment tested for safety. 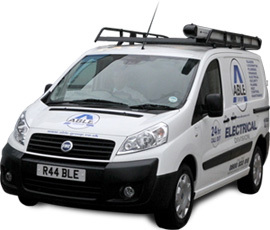 Able Electric provides a pat testing service that is second to none with free quotes by our trained operational staff. We can be contacted 24/7 and when needed, can be at your door within 30-90 minutes to carry out electrical pat testing.